Isn't that the point of this thread? ...could not find a ARMHF Ubuntu 18.04 download suitable for Raspberry Pi 2 / 3B / 3B+ despite googling. Firstly, why are you posting in a Ubuntu thread, when it is clear you have no interest or knowledge in using Ubuntu on the raspberry pi? Apart from de-railing this thread (like I've seen you do countless times) you've contributed nothing. You won't find a preinstalled version of 18.04 for the 3B+. Why on earth would you expect to? You won't even find a server version for the 3B. I don't see the problem with this either. Ubuntu cannot support every Arm board variation. Especially when they are concentrating on Ubuntu core/snap packages. That does not mean the 3B or 3B+ cannot be currently run on Ubuntu/Ubuntu-mate. Apart from de-railing this thread (like I've seen you do countless times) you've contributed nothing. You really are an unpleasant individual. However, I wanted to install ubuntu 16.04.2 or ubuntu-mate-16.04.2, but neither will boot. Anybody have a answer for this Poster ??? OK, not at all pleased with the way this thread has gone. Any more cack I I start wielding the ban hammer. And I really don't care who feels the wrath. Make sure you have the latest bootloader/firmware files. Make sure you have the dtb file for the 3B+. 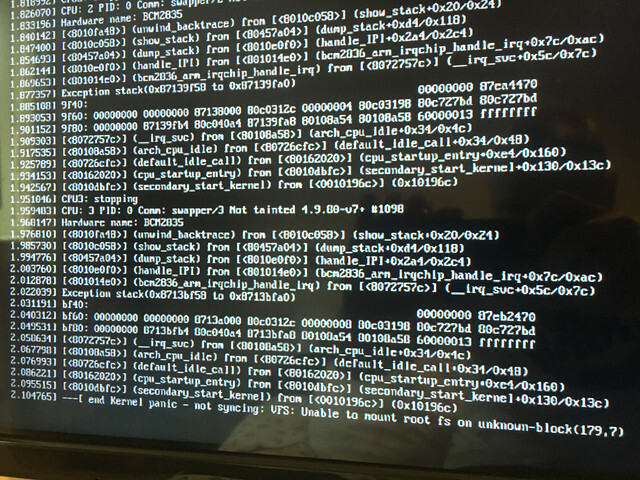 If it still fails to boot, update kernel. Please could elaborate how to update these files if I only have access to a x86 Windows machine to create a bootable SD Card. Therefore I could run Ubuntu ARMHF to see what it offers. No because you are purposefully trying to be difficult/are taking the urine. You can update the bootloader/dtb files very simply from a Windows machine. Last edited by feelslikeautumn on Thu Mar 22, 2018 5:16 pm, edited 1 time in total. - The reason I'm trying to run Ubuntu is that I want to use ROS-Kinetic-full and it's on Ubuntu that it is best / well supported. It's not 100% what you're looking for, but maybe you could try Raspbian + ROS Kinetic? A lot of the instructions are for Raspbian Jessie while you need the latest Raspbian Stretch for the Pi 3B+, so this might not work but it's worth a try. Download the latest Ubuntu image and put it on one card. Download the latest Raspbian image and put it on a second card. Compare the two - only the first partition is relevant, and Windows can see it. Shuffle across any files that appear useful, from the Raspbian card to the Ubuntu card. You can also write one of the two OS’s to a USB flash drive instead of an SD card. You also need kernel7.img and /lib/modules/*-v7+ to get a bootable kernel. Sorry for the noobish first post - I've spent the past 5 hrs formatting and reformatting cards trying to make this work on a 3B+ (i.e. ubuntu-mate), those 5 hrs are my first 5 with a Pi, so bare with me! I've found and copied the kernel7.img, bcm2710-rpi-3-b-plus.dtb but (using a windows PC), I cant see /lib/modules folder let alone any files - so I assume this is on one of the non-windows accessible partitions?? I've copied the dtb, the 4.9.80-v7+ modules folder from a working rasbian SD card and the kernel7 and I still get stuck at the rainbow screen with a lightning bolt. Is there a config file needing updating to tell it to use the new kernel, or some other missing step? I'm assuming this has to be progress in the right direction as I'm off the rainbow screen of death! Will try some more in the coming hours ! Changing the root=/dev/mmcblk0p7 to 2 in the cmdline.txt got it past that error showed the splash screen booting into the gui and then black screened me - re-imaging the card again now for another go maybe I didnt need to copy all the things across that I had done. Start.elf appears to be what gets it going but thus far I cannot actually get it booting into the gui. It's ages since I've used Ubuntu-mate, but it think you should boot into a screen where you enter user details, rather than a GUI. Can anyone confirm? What is the contents of the cmdline.txt in Ubuntu-mate before you make any changes? Although I just put the original back and it still black screens after the splash screen, theres about 40-50 seconds of SD activity after the black screen before the led goes dormant, I did try plugging an analog screen in also and nothing was displayed there either. I'm trying to use the Pi for astronomy - ekos/kstars/indi and all the guides say use Ubuntu-mate although they are a little bit old, maybe it will work on Raspbian now anyway - I dunno... Might try as I cant get ubuntu-mate working at this juncture. I feel your pain trying to solve this. I've been in your position. Although I know Linux very well, booting the pi can be really hard. If you don't know Linux well, then you've set yourself I real challenge with this. I think you are right to check out raspbian. Ubuntu-mate has its problems besides this, raspbian will be a lot smoother if it has the software you want. Good luck! If you hit a black screen like washy, then possibly you can play around with the xorg driver used. Delete this file /usr/share/X11/xorg.conf.d/99-fbturbo.conf and you should switch back to the fbdev driver. I'm really not sure if you need to update the kernel. If you do I'd of thought copying kernel7.img would of been sufficient since all the essentials should be built into the kernel. From memory I don't think you can just copy the /lib/modules/*-v7+ files and expect the modules in there to work out of the box. Happy to be corrected on that. EDIT: washy did you copy the fixup.dat file?